When NASA's Landsat Data Continuity Mission (LDCM) launches on Monday (Feb. 11), it will deliver to orbit the latest and most capable Earth-observing satellite in a four-decade long project to study the surface of our planet. Examining Earth at a resolution of a quarter of an acre (0.1 hectare), the Landsat satellites have enabled a better understanding of deforestation, glacial retreat, the shrinking Antarctic ice sheet, increasing wildfires and other big changes taking place across the planet. "All of these changes are occurring at rates unprecedented in human history due to an increasing population," LDCM project scientist Jim Irons, of NASA's Goddard Space Flight Center in Greenbelt, Md., said during a press conference Friday (Feb 8). When astronauts first left the surface of the Earth in the 1960s, some of their first science objectives involved mapping the planet's surface. But such mapping, linked to human exploration of space, came in starts and stops, failing to provide consistent data. The Landsat program, a joint effort of NASA and the United States Geological Survey (USGS), changed all that. Originally called the Earth Resources Technology Satellites Program when it was proposed in 1966, Landsat officially received the green light in 1970 and first reached orbit with Landsat 1 in 1972. Each new satellite has overlapped with its predecessor, sometimes for years. Landsat 7, launched in 1999, still functions in limited capacity, while Landsat 5 was recently decommissioned after more than 28 years of service. The LDCM spacecraft — set to blast off Monday at 1:02 p.m. EST (1802 GMT/10:02 a.m. PST) from Vandenberg Air Force Base in California — will be the eighth satellite in the program. It will be renamed Landsat 8 after launch and a series of on-orbit checkouts. The USGS will take over operation of the spacecraft at that point, about three months after liftoff. Orbiting the Earth every 90 minutes, the Landsat satellites image the entire planet over the course of 16 days. When two work together, changes on the surface are captured every eight days. Although the technology behind the satellites has improved, the programs manage enough consistency that data from the newest satellite is easily comparable to data from the original. Each Landsat pixel measures 98 feet (30 meters) on a side, capturing enough detail for scientists to glean a great deal of information about environmental change and surface processes. In 2009, the possibilities for Landsat data grew significantly when the entire image library was placed on the Internet for anyone to use free of charge. The archived data, which is managed by the USGS, is the longest continuous record of Earth's land surface as seen from space. The continuous, detailed Landsat coverage creates a wide range of possible uses. Key among those is the management of water resources. Although almost three-fourths of the planet is covered with water, only a small fraction is available for human consumption. "Ensuring the wise use of that scarce resource and maintaining the quality of the water within our water supply is a critical societal goal," said Tom Loveland, USGS Landsat science team manager. Government officials use Landsat observations to monitor deforestation inside their borders. Forest services can monitor the intrusion of pests such as the mountain pine beetle and determine how they will impact day-to-day operations. Before Landsat arrived on the scene, the forest service would make a circle on a conventional map to indicate where they thought such an infestation might be, Wulder said. Today, using Landsat data, they can look at contextual clues from the detailed coverage to determine a more precise location. "The imagery is really allowing them to tackle different problems with a number of different approaches," Wulder said. Landsat assisted in the identification of the breakup of West Antarctic ice shelves, which change slowly over time. By studying the shear margins, where ice flows connect to ice masses or rocky walls, scientists were able to determine the long-term change happening in Antarctica. Landsat also helps with the management of wildfires, allowing scientists to map and monitor vegetation and fire trends and better understand the results once a fire has passed. The U.S. Federal Emergency Management Agency also uses data from the satellites as part of a flood mitigation program. 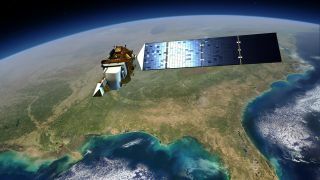 "Both of these programs use Landsat data to measure risk, and to help our country as a whole to avoid that risk and to respond to national disasters when they occur," said Kass Green, president of Kass Green & Associates, a private company that relies on Landsat data for its remote sensing and mapping programs. Opening Landsat to the public means that not all of its applications deal with sustaining human life. Google Earth also makes use of the freely available imagery. "Whenever you're on Google Earth and you go into a regional level, where you look at a state, do you know what you're looking at?" Green asked. "Landsat data." Landsat's continuous coverage over more than four decades has been a tremendous boon for the United States and the world, researchers said. The program's 40-year history allows scientists to track not only seasonal changes but also subtle, long-term shifts in vegetation stress and water levels. With the addition of Landstat 8 to the program, "our record will move from 40 years to 45 to 50 years, or hopefully beyond," Loveland said. But scientists emphasized that it should not be the last mission. "What we must all do is look forward," Green said. "We must ensure there is a Landstat program that will ensure that future generations can look back and see where we've been so they can plan where we're going."